Imagine this. A tall glass of thick, very thick chocolate shake topped with a generous amount of fresh whipping cream and coffee beans. Isn’t this the dessert of your dreams? 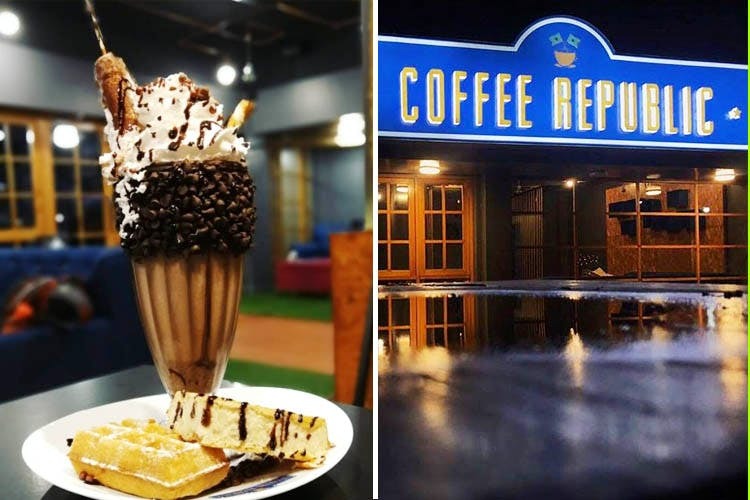 If yes, all you have to do is head to Coffee Republic at Law College Road and fulfill your cravings. Say hi to the Coffee Republic Freak Shake. We loved the presentation of this drink. The upper half of the glass is rimmed with chocolate chips and coffee beans. The freak shake is quite thick and gooey and strikes a perfect balance between the bitter-sweet flavours of chocolate. Adding to these, there’s a choco bar ice cream in the shake, accompanied with crunchy chocolate sticks and Oreo crushes. The top of the drink is made of fresh whipping cream with waffle bits and coffee bean sprinkles. The drink is served with two waffles drizzled with chocolate sauce. If you’re a die-hard chocolate fan, order this delicious freak shake.